If you’re a supreme athlete then it doesn’t take a genius to figure that your diet has got to be pretty top notch. But when it really comes down to it, just how much food, and what type of food, are some of the biggest names in sport and television actually getting down their gullets when preparing for the big event. You’d probably expect athletes such as Conor McGregor, Usain Bolt, and Hafthor Bjornsson to have incredibly strict diets, and you’d be right, but when it comes to maintaining a very specific physique just what is the difference between their diets? Thankfully, the good guys over at Go Compare have put together a helpful info-graphic outlining the diets of everybody from Gwyneth Paltrow, who eats 1,316 calories a day, to The Mountain, who eats around 10,000 calories a day. We decided to outline the difference between McGregor, Usain Bolt, and The Mountain in this article and we’d be lying if we didn’t say that all of their diets are way too intense. We’ll start with the man who apparently eats the least in a day – Conor McGregor. It is pretty surprising that the Notorious has a daily intake of just 1,603 calories – which is weirdly identical to the caloric intake of Rihanna – despite moving up two weight classes in the UFC for his previous two bouts with Nate Diaz. Personally I find that to be quite the fact. Although he is arguably the definition of lean – that’s still a minute number of calories for somebody who spends their days doing some intense physical training and activity. He begins his day with a banana, chocolate and orange sultana loaf before having three sweet potatoes as a mid-morning snack. For lunch Conor enjoys a prawn, egg and smoked salmon pie with a leek, parsley and almond milk sauce on a toasted nut and herb crust – which does actually look pretty damn tasty. 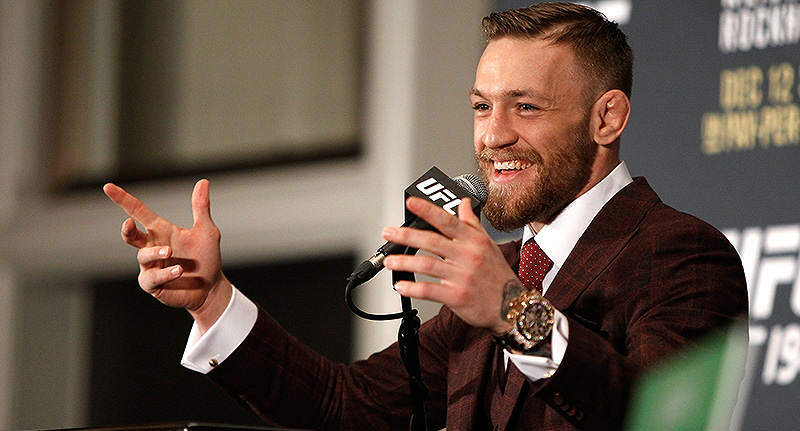 At around 4pm the featherweight champ has a nibble on a plain old protein bar before having a roast rib of Irish beef with carrot mash and caramelised gravy – tasty. On the other hand, Usain Bolt eats 2,223 calories over the course of five meals everyday – which is just short of the Queen’s calorie intake. Bolt likes to start his day with a good old trusty egg sandwich before gouging on a couple of apples. At dinnertime the fastest man in the world chomps on a load of corn beef and pasta – evidently using all of those carbs and protein to boost his sprinting energy. A few hours later Usain devours a fair amount of mango’s and pineapples before gorging on some Jamaican dumplings with roasted chicken and broccoli. However the biggest eater on the list, Game of Thrones’, The Mountain, makes his way through 10,000 calories every day over the course of ten gargantuan meals. Almost all of his meals are high in proteins for muscle growth, healthy fats to keep his joints strong and well protected, and lots of good carbs for energy when he’s hitting the gym. First thing in the morning and Hafthor has a spoonful of glutamine and a handful of almonds shortly followed by a mind-numbing eight whole eggs with 200g of oats with blueberries and strawberries AND a full avocado. Then Hafthor has his ‘second breakfast’ – he’s a growing lad – of a precise 400g of beef accompanied by 400g of sweet potatoes and a handful of spinach and greens washed down with a tasty second glass of glutamine. For The Mountain’s first lunch he makes his way through a Chicken breast with 400g of potatoes and greens, accompanied by a side dish of fruit. Then Hafthor has his, you guessed it, second lunch where he gobbles up 150g of blended oats, 2 bananas, 150g Kellogg’s Rice Krispies, frozen berries, a handful of almonds, peanut butter and glutamine. Oh, and don’t forget his third lunch which consists of 60g of protein powder and two bananas. After what I presume is a hefty gym session with a fair bit of acting thrown in for fair measure, Hafthor hops onto his first dinner consisting of 500g of beef with potatoes and greens. He then swiftly moves onto his second dinner – 500g of salmon with 500g of sweet potatoes. Finally The Mountain fills his tum with six more whole eggs, avocado, 30g of almonds, and 50g of peanut butter. After reading this mind-numbing diet he sticks by day in day out – it’s relatively easy to see how The Mountain goes about crushing skulls like they’re cherry tomatoes. Firstly I find it rather amazing how diverse such diets are. All three of the above are undoubtedly utterly supreme athletes. We have the biggest name in the UFC, the fastest man on Earth, and the two times strongest man in Europe. Personally I find it infatuating knowing just what it is that fuels the body’s of such freaks of nature. But for the time being, I think I’ll be sticking to Tesco meal deals with the occasional scoop of protein after a few hours at the gym.